FRANKFORT, Ky. (Jan. 8, 2016) – A bill introduced in the Kentucky House would make it the express duty of the state legislature to prevent implementation of unconstitutional federal gun laws. Passage of the legislation would represent a small first step toward protecting the right to keep and bear arms in the Commonwealth. A coalition of six Republican legislators filed House Bill 182 (HB182) on Jan. 6. 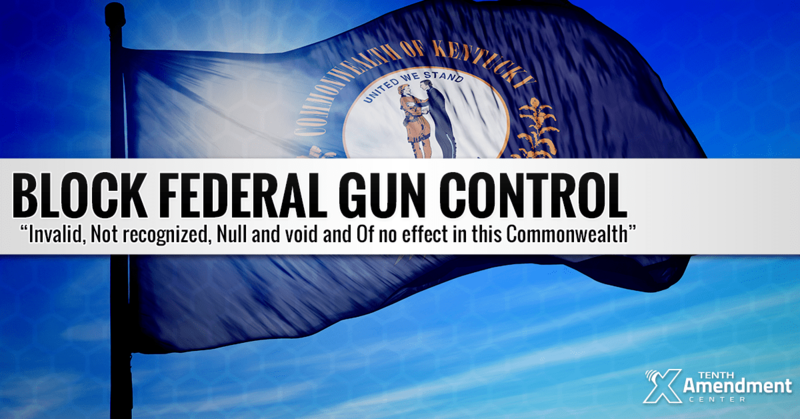 The legislation declares that all federal acts, rules, regulations, laws and orders relating to firearms “that violate the Constitution of the United States and the Amendments thereto” are “invalid, null, void, not recognized, and of no effect” in Kentucky. The bill goes on to direct the state legislature to take all measure necessary to block enforcement of such laws. HB182 rests on sound constitutional principles, and a statutory requirement directing the state to take action against unconstitutional federal gun laws would set the stage toward interposing protecting the right to keep and bear arms in Kentucky. But the language of HB182 is not a complete solution in one fell swoop, since it does not provide any mechanism to determine whether a given federal act violates the true meaning of the Constitution. Before the legislature could even take action on a specific federal act under HB182, it would have have to issue an opinion of constitutionality. This is something that would have to be revisited in future legislation should the bill pass. Alternatively, the bill could be amended to direct the legislature to refuse state cooperation with, and prohibit the use of state assets and personnel in the enforcement of, any current and/or future federal actions relating to firearms. This approach removes the need for a determination of constitutionality and would have immediate effect on any new gun control coming from Washington D.C. This also sets the foundation to reject and nullify any current federal gun control too. Legislation introduced in Virginia for 2016 takes this approach (get model legislation here). By immediately banning state cooperation, state can nullify future federal gun control in practice and effect. The federal government depends heavily on state assistance to enforce its laws. The Second Amendment Preservation Act also cuts through the legal arguments. The Second Amendment Preservation Act rests on the well-established anti-commandeering doctrine. Simply put, the Supreme Court has consistently held that the federal government cannot force or compel states to provide assistance in the implementation or enforcement of federal acts or laws, whether constitutional or not. Taking an anti-commandeering approach removes the need for a determination of constitutionality. HB182 was referred to the House Judiciary committee where it will need to pass by a majority vote before moving on to the full House for further communication. If you live in another state: click HERE and follow the steps to protect the right to keep and bear arms in your state. AN ACT relating to preserving the right of Kentuckians to own and use firearms and declaring an emergency. Create new sections of KRS Chapter 237 to require the General Assembly to enact laws to prevent the enforcement of federal acts that violate the Second Amendment to the United States Constitution; EMERGENCY.